If I have several blogging resolutions for 2009 – and I do – one of them is definitely to read InfraNet Lab more often. [Image: Offshore energy islands, via InfraNet Lab]. Easily one of the most interesting architecture blogs out there today – though it's really an infrastructure blog, hopefully heralding a new focus for design writers in the next few years – and written by Toronto-based architects Mason White and Lola Shepard, along with two contributors named Maya and Neeraj, it tracks massive infrastructure, waste, energy, and design projects across the global landscape, taking in geology, engineering, network economics, ecology, construction innovation, future fuels, and much more. Read it and you'll know how to "harvest energy from the earth's rotation" using mega-gyroscopes, you'll discover how a more efficient offshore seaweed industry might work, you'll pick up clues for how to design a mountain and then how to connect that mountain to others using aerial tramways, you'll get an architectural glimpse of habitat meshing, you'll take an hallucinatory tour through Taiwanese mushroom farms, you'll visit underground waste isolation sites in New Mexico, you'll turn around and go the opposite vertical direction – into the sky – to farm water from the atmosphere, and you'll even punt around the artificial inland waterways of Britain using strange mechanized structures and seeing that archipelago as hydrology first, geography later. So go check it out – and make 2009 the year of networks, grids, and infrastructures. So as not to diminish the contributions of Mason's collaborators -- and we wouldn't want that because not a single post is uninteresting -- it should be noted that not visible on the blog but, on RSS, we see that some of the articles are written by "neeraj" and "maya". And like BLDGLBOG, I suspect there's someone working behind the scenes; for InfraNet, perhaps it's Lola? Indeed. Mason, Maya, Neeraj, Lola: if you happen by, let me know and I'll flesh out the contributors' list. Don't mean to leave anyone out! Interesting read. I hope peope do not abandon their support for alternative energies - now with the dropping of oil prices. Thanks for the words of encouragement GM and co. And yes, Maya and Neeraj joined the lab last november. We are forging ahead as four. Hope to have the "lab" part up in the coming months, in the meantime the blog will be the lead. Have a blast at Rice and say hi to Eva. The islands remind me of Paolo Soleri's work. Do people still read him, Geoff, or do his ideas just recur for some unknowable intellectual or design reason? Mason, I added everyone to the post. I really like the blog! Blaize, I think Soleri's ideas are pretty easy to stumble upon, given some imagination, a few cups of coffee, and some blank paper! Having said that, you still come across articles about him here and there. Your assessment of Soleri makes me feel like an idiot for bringing him up. Sorry, I didn't mean that at all! I'm just not a huge fan of Soleri's. But no offense was meant in my description. Thanks. I appreciate that. 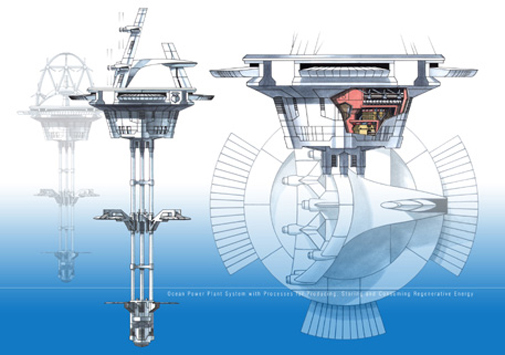 I think Soleri's ideas are nutty, but his drawings are really interesting to me.